The perfect addition to your fairy tale day, these exquisite crystal favors enhance the Cinderella charm of your event! Measuring 1 1/2" by 1 1/2", each of these Cinderella carriage favors is crafted from multifaceted Choice Crystal, majestically perched on silver metal wheels. The enchanting favors are packaged in signature silver gift boxes with white organza ribbon and heart-shaped "For You" tags. I'm sorry we are only able to provide you the measurement of the favor which is 1 1/2" by 1 1/2". Hi, do u deliver to Singapore? & the price in USD? I saw in a previous question that I can just order 1 crystal carriage so I can see what they look like because I will need a lot of them, but will it come with the box & bow so I can see everything? Yes, it will be packaged in signature silver gift boxes with white organza ribbon and heart-shaped "For You" tags. 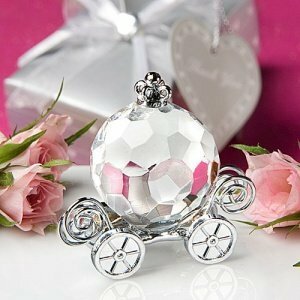 Hi Mari, you can order a sample of this Choice Crystal Cinderella Carriage Favor at a special price of $3.82. Just enter 1 in the quantity box and complete the check out. I wanted to know do you write the name of the bride and groom on the favor's ribbon or card?